The world’s largest gold miner now trades as GOLD in New York and continues as ABX in Toronto. The merged mining company may also sell its 50% stake in Chile’s Zaldivar mine and Randgold’s Tongon, Massawa and Morila assets, Kaip wrote in a report to investors in October. Mark Bristow says he doesn’t plan to retire before seeing the benefits of the merger. Barrick’s new CEO has said it plans to stay at the helm to see Acacia’s conflict solved. He also told CNBC on Wednesday he won’t leave before reaping rewards from the business combination. “It will take a couple of years before we start seeing the benefits of the merger, but I’m not leaving then… I don’t really have a plan to retire,” he said. Bristow noted the issue between Barick’s 64%-owned Acacia and Tanzania had destroyed lots of value. “We need to make sure there’s enough value to work out a solution that various interested and affected parties get something that’s fair and proper for them,” he told Reuters, adding the company would provide more information in the second week of February. 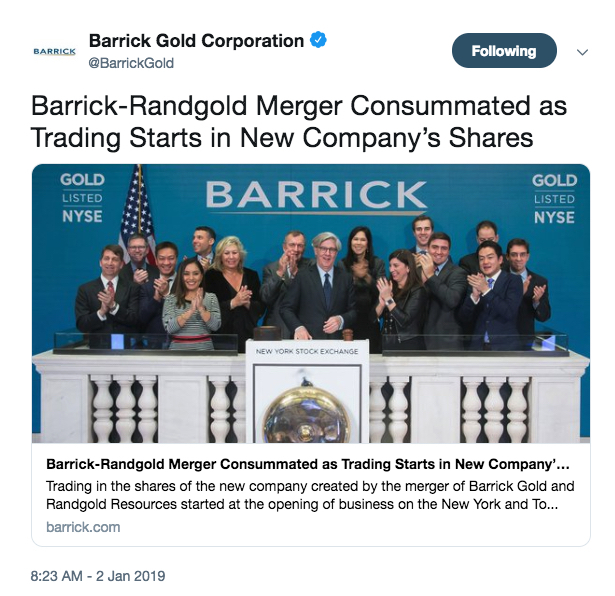 The post New era for Barrick Gold begins appeared first on MINING.com.